This page explains both the meaning of the numerical or rated attributes of the pigments listed in the guide to watercolor pigments, and how the ratings were made. The paint attributes are presented as numerical ratings or measured color values because numbers are convenient to tabulate as a web page. Thus, if a paint is rated 4 on "transparency," then it is completely transparent; if it is rated 0, then it is completely not transparent  that is, opaque. If a paint is rated 3 on "staining," then it is somewhat but not strongly staining, and if it is rated 1, then it is close to nonstaining, but stains a little. The only exceptions are the ratings for value range, hue angle, and hue shift, which are derived from spectrophotometric measures of color appearance, as explained below. To help you along, the comments under each pigment in the guide to watercolor pigments first summarize the average rating for that pigment across all tested watercolor brands. Thus, the comments for pyrrole red (PR254) begin: "Pyrrole red PR254 is a very lightfast, semiopaque, highly staining, dark valued, intense medium red pigment." 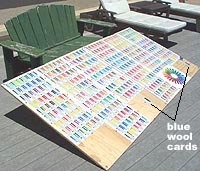 All ratings are based on paint swatches prepared in exactly the same way, as described here, and illustrated below. Transparency was measured by drawing 2 closely spaced black lines on the watercolor paper with a broad tip Sharpie indelible pen, painting over the lines a brushstroke of paint diluted to approximately a 1:3 concentration with water, then drawing a third line across the paint swatch after it had completely dried. The rating indicates the difference in blackness or darkness between the lines underneath the paint and the line drawn across the paint, or between the lines underneath the paint and the lines as they appear on either side of the swatch. Low transparency (high hiding) often indicates a "sedimentary" or thick paint formulation, but note that all paints can be made more transparent by diluting them with water. My ratings are conservative; many artists will find paints rated as "3" are more than transparent enough for excellent glazing results. Note that "transparency" as it is defined among watercolor painters is actually called hiding by paint industry professionals: transparency is measured by how much a paint color completely disappears when the paint is applied on a completely black surface, a test that reveals the quantity of colorless ("transparent") laking substrate or white brightener in the paint. Staining was measured by applying a brushstroke of paint diluted to approximately a 1:3 concentration with water, allowing the paint to dry completely, then firmly wiping the paint five times with a wet cotton swab and blotting the paint dry. The rating indicates the amount of paint or discoloration that remained on the paper. Note that many watercolor tutorials equate staining with the tinting strength or dominance of the pigment in paint mixtures, which is inaccurate. Staining is commonly said to be an attribute of a pigment or paint, which is also inaccurate. In fact, staining occurs for many reasons. Staining paints are usually caused by smaller pigment particle sizes and/or a higher electostatic attraction between the pigment and paper fibers (pigment attributes); by a higher proportion of dispersant or humectant in the paint, which diffuses the pigment particles deeper into the paper fibers (paint vehicle attribute); or by unsized or lightly sized papers, by papers with a rougher surface finish, and by papers made with insufficiently macerated pulp (paper attributes). Staining is desirable in paints that will be applied as a background wash that will be painted over, since the color will not lift if rewetted, scrubbed or blotted. However, any staining paint can redissolve when wetted, tinting new layers of paint: this is usually indicated by the measure of blossoming. I use the value range for two reasons: it provides a perceptual zero point for judging the relative lightness of paints (a paint with a VR of 60 appears to be twice as dark as a paint with a VR of 30), yet it preserves the metric of the CIECAM J scale. The value range is useful to work out the gamut mapping of a painting: the actual lightness of a "black" standard shifts substantially across the darkest materials in different media, while a "white" standard is the same across them all, making it a better anchor for lightness comparisons and for locating a middle gray. The value range, tinting strength and dilution of a paint determine its dominance in mixtures with other paints: a dark valued, strongly tinting and weakly diluted paint has the largest effect in mixtures. Granulation was measured as the visible or tactile graininess, clumping or texture of the paint when applied as a wash in dilute concentration. This rating includes granulation and flocculation or the apparent clumping of the pigment texture into tiny flakes or spots (for example, in ultramarine blue). Diffusion was measured as the amount of movement by the paint beyond the brush mark when applied to a premoistened area of watercolor paper (wet in wet). Greater diffusion is caused by a smaller size and lower specific gravity (weight in water) of the pigment particles, and by an increased density in the composition and concentration of the vehicle. Very small, light pigment particles, such as carbon blacks, iron blue and the phthalocyanines (see the table of pigment particle sizes), will diffuse slowly through osmotic dispersion in water. Rapid, shooting diffusion in soft or finely divided pigments such as cadmiums, chromium oxide, ultramarine blue or iron oxides ("earth" pigments) is caused by a soaplike dispersant or wetting agent (such as ox gall) used to prevent pigment clumping in storage or reduce milling time during paint manufacture. 3 = active: diffusion up to 3/4"
2 = slightly active: diffusion up to 1/2"
1 = sluggish: diffusion up to 1/4"
After calibrating the Spectrolino to the manufacturer's white standard (a pure white ceramic chip), two measurements were taken of each paint swatch; if these differed by more than five units on either the a* or b* dimension, a third measure was taken and the average of all three was used as the result. I measured the masstone (full strength) color rather than the undertone (diluted) color because the masstone is usually close to the optimal paint dilution (has the highest chroma). A few years after I made these measurements, the CIE published the CIECAM color appearance model. Using the original XYZ measurements and standard values for the color illumination and display, I calculated the pigment average color measurements for the CIECAM aCbC plane and included these Jab values in the notes under each pigment entry. I also used the average CIECAM color appearance values in my artists' color wheel. CIECAM is generally a more accurate representation than CIELAB of perceived color attributes and complementary hue relations. The CIELAB hue angle values are kept in the pigment guide because they are adequate to show the hue differences between different paints or pigments, which is their purpose. The descriptive hue categories used on this site follow the straightforward system introduced by Moses Harris in 1766, but with three changes: (1) the insertion of the hue category orange, (2) the addition of deep red (dark spectral red) between red and violet red, and (3) the addition of hue categories for the "earth" (iron oxide) pigments and synthetic organic pigments that resemble them. These added categories reflect the greater perceptual discriminations usually applied across the "warm" colors, and also respond to the very large proportion of pigments that are found in the yellow, orange and red range of hues. These hue categories are based on the average CIECAM hue angle for all paints in each category listed in the guide to watercolor pigments. The diagram below, a palette scheme, summarizes the relative placement of these hue categories around the CIECAM hue circle. Click on the diagram to view the key to the palette scheme. Click on any color icon in the key to view a complete listing of the pigments available in watercolor paints in that color category. In the guide to watercolor pigments, the hue angle for individual paints is reported in degrees of the CIELAB a*b* plane, where hue angle increases in counterclockwise direction from 0° (magenta, placed on the right horizontal axis) through 90° (pale yellow) to 180° (blue green) and 270° (middle blue). The text description of each watercolor pigment adopts the hue categories used in the complete palette, which are based on the average CIECAM hue angle for all paints containing that pigment. This is done to match the pigment description to the pigment location within the artists' color wheel and the CIECAM aCbC plane. The shift in a paint's hue from masstone to undertone (from full strength to tint) defined as the undertone hue angle minus the masstone hue angle. (The measurement of hue angles is described above.) A plus HS means the paint hue moves counterclockwise on the CIELAB a*b* plane (from red to yellow to green to blue); a minus HS means the hue moves clockwise. See the page on color in the world for an explanation of why a hue shift occurs. A monochrome paint will present the same hue across a wide range of wash mixtures. A duochrome paint will shift, for example, from orange yellow in masstone to a pale yellow in undertone. The shift is reported in degrees of the CIELAB a*b* plane, as the hue angle of the tint minus the hue angle of the masstone. Note: On a standard artists' color wheel (with yellow at the top and red on the left), a "+" indicates a clockwise shift (from red to yellow or green to blue), and a "-" indicates a counterclockwise shift (from red to blue or green to yellow). Lightfastness is a measure of the fading, darkening or discoloration of a pigment (paint) that results from daily, unprotected exposure to high intensity light. This is used to estimate the amount of fading that the pigment would show to daily light exposure under normal conditions of display  that is, framed under a glass or acrylic sheet, away from direct sunlight or direct indoor halogen or fluorescent light, and exposed to light for up to 12 hours per day. Lightfastness is reported as the blue wool level at which significant color change appeared in a tint (diluted) or full strength (concentrated) sample of the paint. The most common effects of prolonged light exposure are lightening of the tonal value and/or a fading (desaturation) of the color, but some paints will darken, opacify or discolor (shift in hue) instead. The specific type of change is reported in the notes to each pigment. Finally: always treat lightfastness ratings as advisory only. Some pigments show highly variable lightfastness, and pigment manufacturers and art supply companies are continually changing their products, not always for the better. Your only assurance is to do your own lightfastness tests, and to treat cautiously any pigment with highly variable ratings across paint manufacturers (such as iron blue, PB27 or dioxazine violet, PV23), or any paint with ratings of 6 or lower on the blue wool standard used here. For more information, see the section on lightfastness tests and lightfastness with a grain of salt, and the comments in palette paintings. See this table for the blue wool levels divided into the ASTM lightfastness categories. Individual paint chroma is not provided in the numerical paint ratings because the visual impact of the same measured chroma is different across different hues and lightnesses, and because it appears to be the attribute that is most sensitive to the specific method of paint application, and therefore is the least reliable attribute to measure. However, the masstone chroma of all paint swatches was measured using a GretagMacbeth Spectrolino spectrophotometer (as described above), and the CIECAM chroma results of these measurements, averaged across all paints tested for a pigment, are reported in the average pigment values provided in the text description of the pigment. The labeled chroma categories listed at right provide a general interpretation of the numerical average chroma values; the category "supersaturated" primarily describes fluorescing paints and theoretical (nonmaterial) optimal colors. For example, any pigment described as "very intense" has an average JCh chroma between 81 to 95; a pigment described as "intense" falls between 67 to 80; a pigment described as "very dull" falls between 13 to 25, and so on. When describing colors using the more subjective method of visual inspection, a reduced set of five chroma categories is more appropriate. Convenient terms are gray, very dull, dull, intense and very intense, with the boundary between intense and dull judged as color that is approximately halfway between pure gray and the most saturated color possible with that pigment. The examples below suggest the chromatic intensity described by the eight (spectrophotometric) and five (visual) chroma categories for different hues constrained to have the same lightness (J = 55). As this diagram shows, the chroma categories provide approximately equal perceived differences in chroma across all hues, but the maximum possible chroma within each hue is different. Thus a mid valued yellow never appears much more than dull, and this is inherently because of the way our color vision is structured (intense yellows only appear at high lightness). Higher chroma is possible in greens, blues and purples, but the maximum chroma it is possible to display in a digital image (and in watercolors) is much lower than the perceptual limit defined by an optimal color of the same hue and lightness. It is mostly oranges and reds that achieve the highest chroma in photographic, print or digital media, and also yellows in paint media, because pigment chemistry can produce the "warm cliff" profile in pigment reflectance curves that nearly matches an optimal color with the same hue and lightness. Paints lose chroma (and saturation) as they are diluted toward tints, although there are exceptions to this among very dark paints and for some paints on the warm side of the color wheel. Watermedia paints (watercolors and acrylics) change color appearance as they dry. Measurements were made in units of the CIELAB color space with a GretagMacbeth spectrophotometer of 2 cm wide paint swatches on Arches CP watercolor paper. The first measurement was made while the paint swatch was still glistening moist (about 30 to 60 seconds after application), and the second 4 or more hours after the paint had dried. This procedure was done on two separate swatches and the results averaged to reduce error. Shifts are reported for 75 commonly used watercolor pigments or convenience mixtures in this table, which can also be sorted by total color change, or change only on lightness (value), chroma or hue angle. Results are described in the notes to individual pigments as the percentage change in color lightness or chroma, using the quintile labels at right. These data show that loss of chroma (saturation) is consistently the primary change in color appearance, and many colors actually darken as they dry: the commonly repeated statement that "watercolors lighten as they dry" is inaccurate. I've attached here four test swatches (for Daniel Smith and Winsor & Newton earth colors) to illustrate the general approach and specific examples of how the test samples were interpreted to derive the ratings.  Transparency. The Daniel Smith raw sienna shows a clear masking of the two black lines drawn in indelible ink on the watercolor paper. This is also apparent by comparison to the third line drawn below, on top of the swatch after it dried. By comparison, there is no apparent masking of the lines on the paper (difference in lightness between these lines and the line drawn on top of the swatch) in the Winsor & Newton raw umber. Transparency ratings: DS raw sienna = 2 (semiopaque), DS raw umber = 3 (semitransparent), W&N raw umber = 4 (transparent), W&N burnt umber = 3.  Staining. All the pigments clearly stain the paper, but vary in how much of the pigment can be removed with a web cotton swab. The Winsor & Newton burnt umber is the most extreme, but is not as staining as the most intensely staining paints. The raw sienna and W&N raw umber are both mostly lifted. Staining ratings: DS raw sienna = 1 (lightly staining), DS raw umber = 3 (staining), W&N raw umber = 1, W&N burnt umber = 3 (staining).  Value Range. The color attributes of the test swatches were measured using a GretagMacbeth spectrophotometer and its computer color analysis program. The paint's CIELAB L* (lightness) was measured in the masstone area just below the black transparency test lines, as this is the maximum paint concentration typically used in most paintings. This lightness value was subtracted from 97 (the lightness of white paper), to give the value range. Value Range ratings: DS raw sienna = 37 (mid valued), DS raw umber = 66 (dark valued), W&N raw umber = 36 (moderately light valued), W&N burnt umber = 57 (moderately dark valued).  Granulation. Inspection of the "thin" end of the swatch, the diffusion test below it, and the texture on the brush, all indicate these pigments have a liquid to powdery texture. However, the Winsor & Newton shows a slightly greater texture, noticeable as the diagonal darkening at the top of the swatch, caused by the difference between coarse and fine pigments. 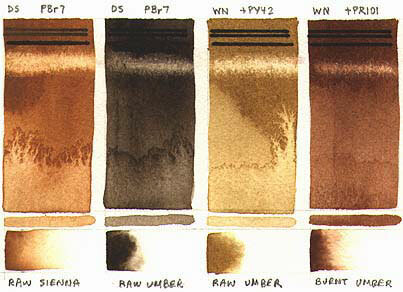 Granulation ratings: DS raw sienna = 1 (powdery), DS raw umber = 1, W&N raw umber = 2 (slight texture), W&N burnt umber = 1.  Blossom. Blossoming is revealed in the amount of mottling, movement or discoloration of the partially dried test swatch under an application of clear water (at the bottom of each swatch). This is in general a test of the osmotic pull of the pigment particles, the solubility of the vehicle after it has dried, and the ease with which the paint can be modulated in washes. Blossom ratings: DS raw sienna = 3 (moderate blossom), DS raw umber = 2 (slight blossom), W&N raw umber = 3, W&N burnt umber = 1 (slight water discoloration).  Diffusion. The amount of movement of the paint in a patch of clear water (painted horizontally at the bottom of the test swatch). This is measured as the horizontal distance the pigment travels from left to right. Most earth pigments are relatively inert when used wet in wet. Diffusion ratings: DS raw sienna = 2, DS raw umber = 1, W&N raw umber = 1, W&N burnt umber = 1.  Hue and Hue Shift. The color attributes of the test swatches were measured using a GretagMacbeth spectrophotometer and its computer color analysis program. Readings were taken of the thin diluted wash at the bottom and of the masstone area just below the black transparency test lines; the difference between these two hues, in a*b color angle, is the measure of hue shift. I report the masstone reading (not the undertone) as the hue angle and value range of the pigment, as the masstone is closer to the typical concentration of paint in actual paintings. Hue shift ratings: DS raw sienna = +13, DS raw umber = +6, W&N raw umber = +5, W&N burnt umber = +10.  Lightfastness. The manufacturers each rate their paints as a 4 (very lightfast), and this is consistent with the ratings given to the paints by third party publications, the ASTM, and the consensus testimony of art handbooks and pigment industry sources. However, I conducted my own lightfastness tests (in 1999 and 2004) on all single pigment paints and many convenience mixtures from each brand. The Daniel Smith paints are single pigment formulations; the Winsor & Newton are mixtures of two or three iron oxides. Lightfastness ratings: DS raw sienna = 8,8 (completely lightfast), DS raw umber = 8,8, W&N raw umber = 7,8, W&N burnt umber = 7,8.